At Grand Prix we were missing one of our regular crew members - Ben Colwell. If the truth is to be told Ben had jumped ship in order to compete in the 2012 Sperry Top-Sider NOOD Regatta in the British Virgin Islands. For those unfamiliar with the NOOD regattas, they consist of a series of regattas around the county (all one-design), the winners of which each winning a chance to participate in a championship event in the British Virgin Islands. Each of the regional winning teams receive a 5-night charter for up to six crew members aboard a Sunsail 44. 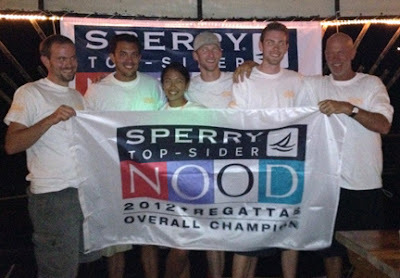 After four days of buoy and distance racing against six other top teams Ben and his team won the overall title and were crowned the 2012 NOOD Overall Champions -- great work and congratulations!